DeFender XC Spyder Side Inserts for Jeep Wrangler TJ 1997-2006. Complete your Poison Spyder DeFender XC installation with these Spyder Side Inserts, which fill the access ports in the side panels of the DeFender XC. 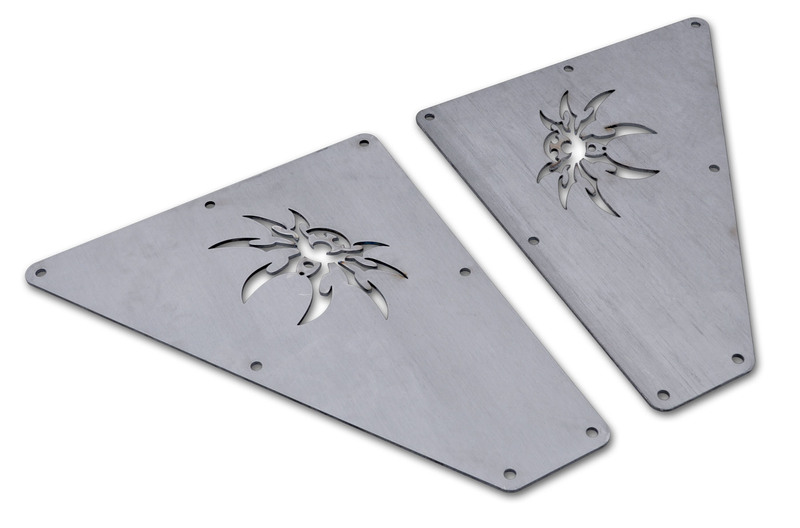 These DeFender XC Side Inserts are CNC laser cut from 1/8 inch aluminum plate. The Spyder logo cut-out acts as an air vent to promote airflow through the engine bay. The Side Inserts are designed to bolt to the inside surface of the DeFender XC, using the supplied stainless steel button head hardware. This product ships as bare aluminum. You may want to have it painted or powdercoated prior to final installation. We do Not offer a powdercoat option for this item. Add some Spyder styling to your DeFender installation!